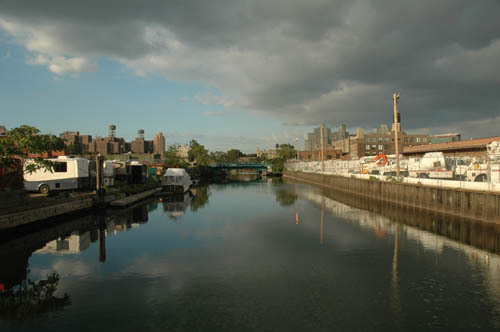 The Gowanus Canal CDC has released its final plan for Gowanus. The news comes via a release from the CDC and its chair Michael Ingui. The final plan is posted on the CDC's website. (We are not posting a direct link to the PDF because it is big and can virtually freeze your computer depending on your connection. Release of the plan is also reported by Brownstoner.) It divides the neighborhood into North and South "zones," each of which would feature a different mix of uses. Overall, the plan pushes a "green" focus for new development and industry. There is also a development on the Gowanus Canal Conservancy front. The group was formed this summer to help advocate for improving the environmental quality of the canal and for making it more friendly to recreational uses. The group wants to create a Gowanus Canal Environmental Education Center on the Big G with classroom and meeting space, an auditorium, office space for Gowanus-related groups and a boat launch. The plan, "includes the concept of the 'canal as park' – viewing the waterway, like a park, as a precious community resource for all users, industrial and residential, to be improved and protected." The group is apparently looking at the creation of a "Canal Improvement District." We will dive into the plan a bit more in coming days, but for now, it's worth pointing out that the it is an independent vision of Gowanus' future. The city is just beginning its planning effort for the neighborhood that will serve as the basis for a comprehensive rezoning. Developers have already expressed frustration that the process is moving slower than they would have hoped. The debate will prove interesting. "Now where did you get the dumb idea?" Where dose GCCDC come by their north/south zones? Are there any solid planning idead behind this, other than giving the developers just what they want? If you look at the Gowanus form Google Earth, anyone can see that the water quality at the north end is undescribable! And also, the DEP has clamed most of it for catching those "floatables". So why does this organization think this is the place to put housing? Do they believe New Yorkers want to live next to this stuff? Being concerned about environmental issues, I was wondering if you knew about Sound Experience where kids and adults learn about the Puget Sound as well and how our choices impact the environment. I find that hearing about such programs guves me a little shot of hope so I thought I'd give you the link, too. Please take a look. It is a wonderful program!! !